Do you have a makeup lover in your life? Kathy is going to take you step by step to create a luscious lipstick holder with the fabulous Dovecraft Kiss and Makeup collection and with our free template, yipee! 1. Download and print your free lipstick holder template. Cut out each element on your printable. 2. Take the top template on your printable and draw around it on to a piece of red card from your First Edition Textured Card Stock 12x12 paper pad. Follow your printable and score where shown on to your red card. 3. Take a sheet of lipstick paper from the Dovecraft Kiss & Make Up 8x8 collection and cut two rectangles measuring 6cm by 8.5cm and one rectangle measuring 1.5cm by 8.5cm. Adhere with Dovecraft Perma Fix tape to the sections on the front of your card. 4. 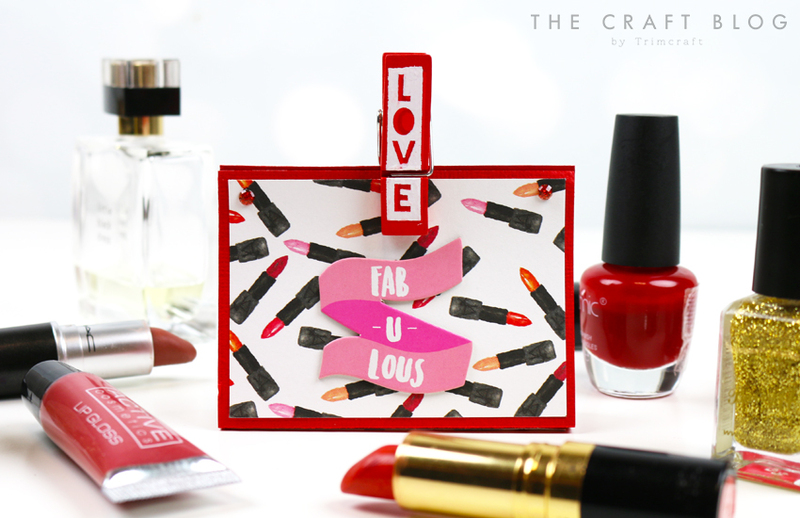 Take the second template from your printable, draw around and cut out from a piece of lipstick paper from the Dovecraft Kiss and Makeup collection. 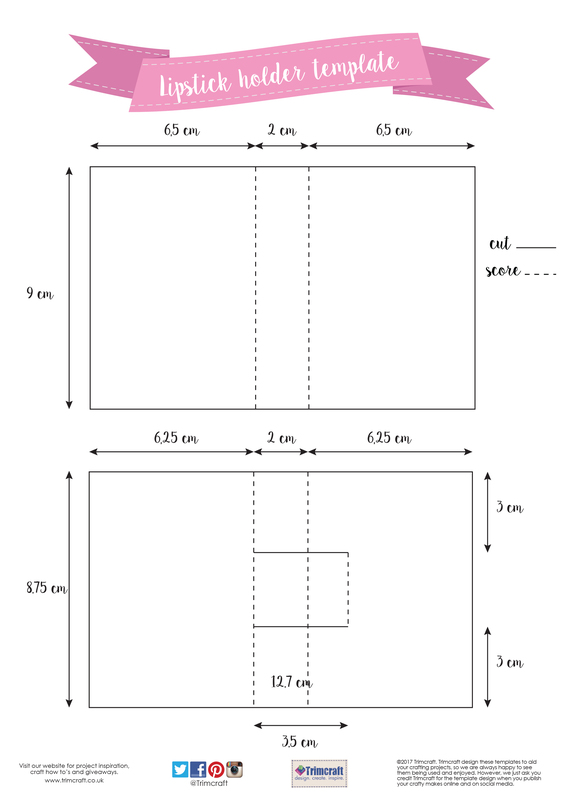 Score and cut where shown on the template. 5. Adhere this lips sheet to the back of your red card, with Dovecraft Perma Fix tape. This will now act as the inside of your lipstick holder. 6. Decorate the front of your lipstick holder with the Kiss and Makeup dimensional stickers and glitter dots. 8. Keep your lipstick holder secure by adding a Kiss and Makeup min peg to hold the two sections together, at the top. This lipstick holder will make a wonderful favour at a beauty blogger event or as a gift for those who just adore adding to their lipstick collection. The Kiss and Makeup papers designed by Kendra Dandy are a must have for your glamour friendly gifts! How will you use our free lipstick holder template? We would love to see so don’t forget to upload your makes to the inspiration area and to #trimcraft when sharing on social media.